The effects of ultrasound (US) pretreatment on drying kinetics and quality attributes including phenols and ascorbic acid content, color parameters (L*, a*, b*, ∆E, BI, and H°), and rehydration kinetics of kiwifruit slices were investigated. Microstructure observations of raw and US pretreated samples were also performed. Results revealed that US pretreatment reduced drying time of kiwifruit slices by 16.67–25.00% compared with the untreated samples. Weibull distribution model could precisely fit the drying behavior of samples under different treatments (R2 > 0.99). 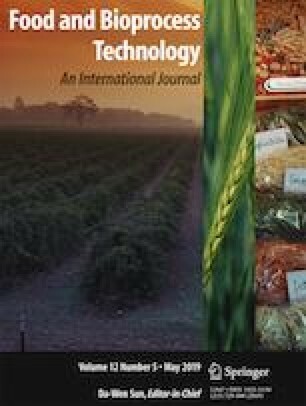 US pretreatment had a positive effect on phenolic compounds preservation but had a negative influence on ascorbic acid and solid retention. The highest loss of ascorbic acid was 40.69% after US pretreatment and 87.71% after drying compared to the content of fresh ones. Color change of kiwifruit slices was mainly caused by drying. Page model adequately predicted the rehydration characteristics of dried samples under all conditions. Microstructure observations explained why US pretreatment increased the moisture diffusion ratio and reduced the rehydration time. The findings in current work indicate that although US pretreatment can enhance drying process, it is not an ideal method for kiwifruit slices due to high loss of water-soluble nutrients. 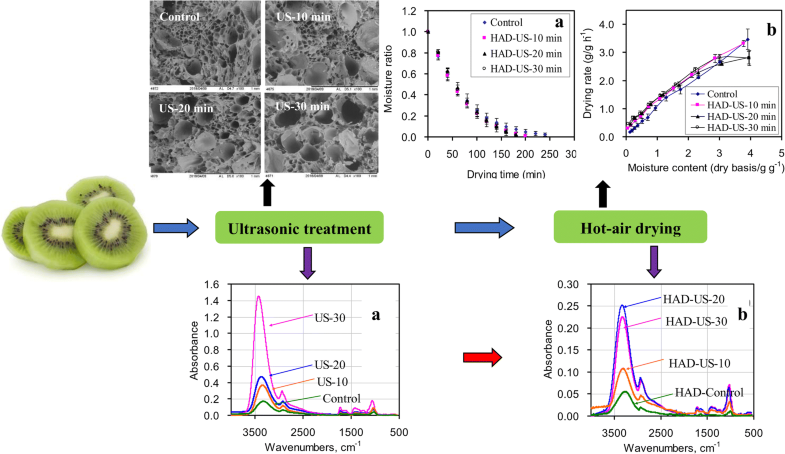 Effects of ultrasound pretreatment on the drying characteristics, ascorbic acid, phenol compounds and microstructure of kiwifruit slices. ● US pretreatment reduced drying time of kiwifruit slices by 16.67-25.00%. ● US pretreatment has a negative effect on the ascorbic acid content. ● The Page model describes rehydration kinetics well. ● US pretreatment is not an ideal method for kiwifruit slices drying. The main corresponding author is Jin Wang, and Hong-Wei Xiao is the co-corresponding author for this paper. This study was financially supported by China Scholarship Council (CSC) [grant number 201706350195] and the Natural Sciences and Engineering Research Council of Canada (NSERC). USDA, U., (2018). National nutrient database for standard reference, Legacy Release. Available from https://ndb.nal.usda.gov/ndb.